#1 – CASS scholars cite President Hu Jintao’s participation in the 2011 G20, BRICS, and APEC meetings, as well as his meetings with Brazilian President Dilma Rousseff and Peruvian President Ollanta Humala as evidence of China’s deepening relations with the region. 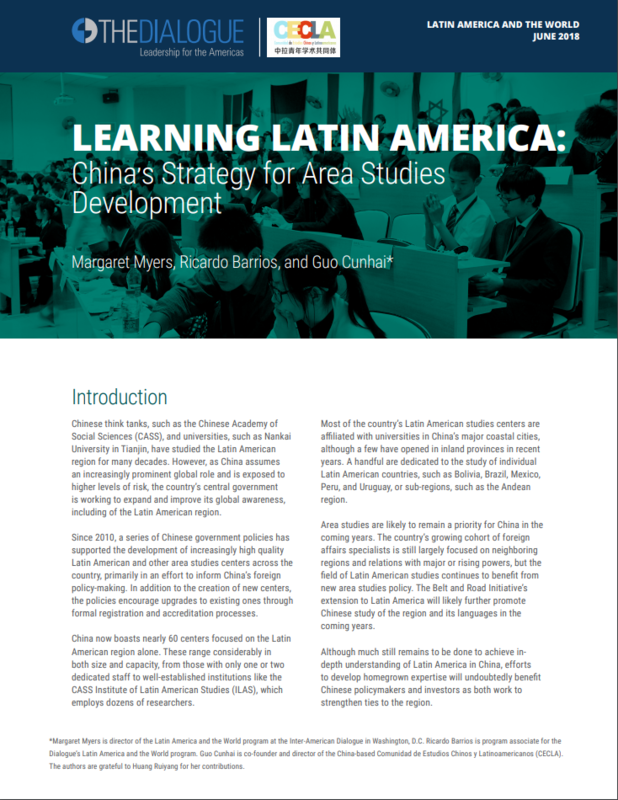 They also mention high-level visits to Latin America by Xi Jinping (current vice-president and presumed future president of China), Wang Qishan (vice-premier), Hui Liangyu (vice-premier), Liu Yandong (politburo member and state councilor), and Chen Changzhi (vice-chairman of the Standing Committee of the National People’s Congress). Growing trade between China and Latin America ($196.7 billion between January and October of 2011); a successful China-Caribbean Economic and Trade Cooperation Forum; and visits to China by Dilma Rousseff, the prime minister of Barbados, and Evo Morales are all cited as additional examples of deepening bilateral cooperation. Mexican President Felipe Calderón’s meeting with the Dalai Lama, as well as China-targeted protectionism in Argentina and Mexico are examples of “disharmony,” according CASS Institute of Latin American Studies scholars. #2 – In April 2011, the Sixth Congress of the Cuban Communist Party endorsed a fundamental change in the country’s political and economic model. 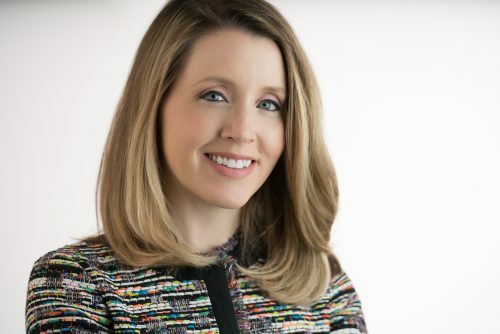 It proposed a smaller role for the state, an end to certain government subsidies, and the possibility of term limits for high-ranking government officials. Though likened to China’s economic reforms in the 1980’s, the island’s reforms fall short of China’s “reform and opening-up” policies and move toward “market socialism.” A Chinese magazine article argued in May that as a result of reforms, Cubans are now calling long distance on cell phones, staying in five-star hotels, using computers, and even shopping online. Such activities remain a distant reality for most Cubans, however. Though praising of Cuba’s new policies, the same article maintained that further economic reform is necessary to avoid a “crumbling” of Cuba’s economic system. #4 – CASS scholars mention wins by Michel Martelly in Haiti, Ollanta Humala in Peru, Christina Fernandez in Argentina, Daniel Ortega in Nicaragua, and Donald Ramotar in Guyana as evidence of continued center-left regime popularity in Latin America. While there has been some preference on the part of Chinese firms to negotiate directly with specific Latin American leaders, and especially those of the leftist variety (Chavez and Correa, for example), China’s engagement with the region has, in most all cases, been pragmatic in nature and profit-driven. China’s scholars and firms are increasingly cognizant of Latin America’s political trends, however. Investment-related controversy in countries like Burma and Libya has highlighted the importance of political calculation and risk assessment on the part of would-be investors. #5 – In the decades following the 1989 student-led pro-democracy demonstrations in Tiananmen Square, the possibility of social instability brought about by student protests is of ongoing concern to China’s leaders. The Chinese government has done much in the past few years to tackle those issues thought to have contributed to the Tiananmen protests — inflation, government corruption, and unemployment, for example. While Chile’s education-related protests had little chance of provoking similar activity across the Pacific (despite similar concerns in China regarding education access and quality), they did expand to include broader interest groups and issues — from constitutional reform to a revamped tax system. 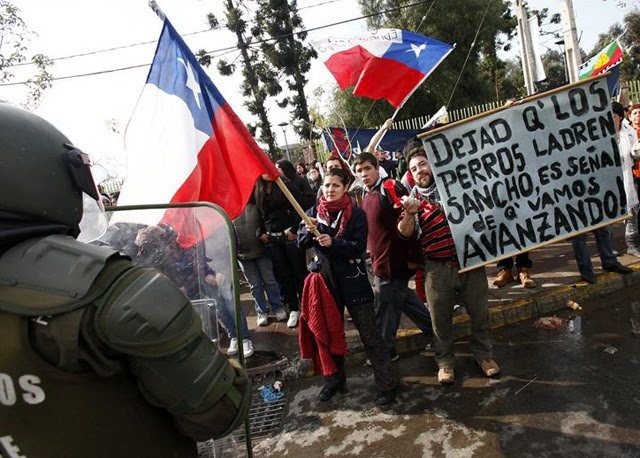 Chile’s protests also sparked education-related demonstrations throughout the Latin America, as noted by CASS scholars. China, for its part, remains vigilant against any indications of Arab Spring-inspired discontent. #6 – China has no illusions when it comes to doing business in Venezuela. The risks of direct negotiation with Chavez are increasingly apparent to China’s firms and major financial institutions. The leader’s cancer diagnosis has introduced an even greater degree of uncertainty for Chinese interests in Venezuela. In recent months, the Venezuelan opposition suggested that Chavez’s oil-based agreements with the Chinese are unconstitutional and illegitimate. According to National Defense University scholar, Evan Ellis, this could lead a post-Chavez government to question its legal obligation to honor agreements with China. Chavez’s medical treatment in Cuba, as well as his suggestion that U.S. was responsible for cases of cancer among Latin America’s leftist leaders, received signficant media coverage in China. #7 – CASS scholars highlight Obama’s visits to Brazil, El Salvador, and Chile, as well as the U.S. 2011 focus on “equal partnership” when engaging countries in the region. In its own dealings with the Latin America, China promotes a “win-win” policy of “mutually beneficial” interaction. President Hu Jintao made no official visits to specific Latin American countries in 2011, but vice-president (and likely future president) Xi Jinping visited Cuba, Uruguay, and Chile, where he reached a number of primarily investment and/or trade-based agreements with the countries’ leaders. #8 – Brazilian president Dilma Rousseff visited China in April of 2011 after taking office in January. She sought promises from China’s leaders regarding diversified trade, as well as agreement on Brazilian meat exports, a China Southern contract for twenty Embraer jets, and an agreement with Taiwan’s Foxconn to manufacture electronics in Brazil. Other deals ranged from agriculture cooperation to plans for Olympics-related infrastructure development. The visit was seen widely as an indication of the growing importance of the China-Brazil relationship. Following her visit to Beijing, Rousseff attended the BRICS summit in Sanya on China’s Hainan Island, where she met with leaders from the four other BRICS nations. #10 – China has established its own free trade agreements with three countries in Latin America – Chile, Peru, and Costa Rica. The Costa Rica FTA came into effect on August 1, 2011. According to Costa Rican press, China and Costa Rica have been working ever since to implement its various provisions. The FTA currently enables over 60 percent of the countries’ products to enter each other’s markets duty-free. Chinese textiles, machines, electric appliances, vegetables, fruits, automobiles, chemical products, raw fur and leather exports are expected to benefit from the agreement. Costa Rica should see higher sales of coffee, beef, pork, fruit juices and jam in the Chinese market. China also maintains bilateral investment protection agreements and bilateral tariff reduction agreements with certain countries in the region, most of which were implemented in the mid-1990s or early 2000s.